The exterior of 111 West 57th Street. 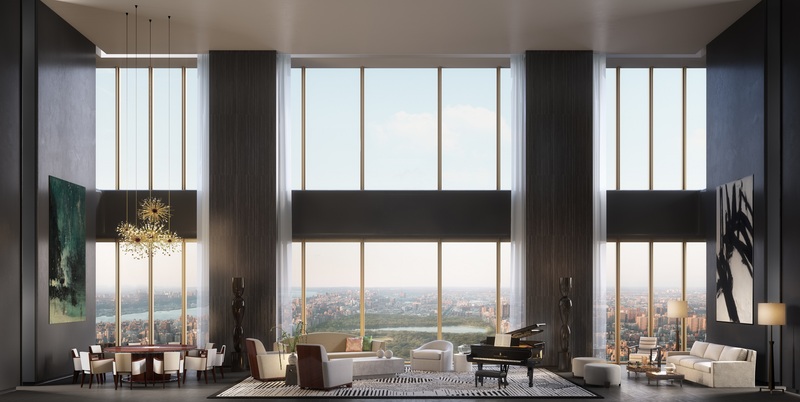 New York City condominiums have reached a new level of excellence and design sophistication at 111 West 57th Street. The graceful tower, designed by SHoP Architects with interiors by Studio Sofield, will rise to a soaring 1,428 feet above the landmarked Steinway Hall when completed. With one tower residence per floor, this exclusive offering will feature 46 beautifully proportioned full-floor and duplex residences, with unparalleled 360-degree views of Central Park and the Manhattan skyline. As of January 15, 2019, construction on the tower surpassed the 82nd floor, with the crown of the building set to be fully enclosed by June. Sales for the building were launched in September of last year by JDS Development Group, Property Markets Group and Spruce Capital Partners. Knight Frank Asia Pacific Head of Residential Victoria Garrett said 111 West 57’s outstanding location and architectural treatment resonate strongly with buyers from the region. “Asian buyers are now the single most important force in global luxury residential markets," she said. "Their tastes and requirements are helping to shape development design and specification and I expect to see these purchasers making a mark on this scheme." The pre-war Steinway Hall was declared a “timeless monument to classical music and architecture” in 2001, with its well preserved interior rotunda designated as a New York City landmark in 2013. It is this foundation which inspired acclaimed interior design firm Studio Sofield, led by Principal William Sofield, to create new residential environments that celebrate extraordinary detailing and materiality while balancing opulence and elegance. As part of the construction process, Steinway Hall has undergone significant restorations and re-fabrications to preserve its rich history. The historic building is currently being reimagined and integrated with the new tower as remarkable residences and amenity spaces. Cladding the east and west facades of the new tower is a unique terra-cotta and elegant bronze filigree, which creates a dynamic, textural play of light and shadow. A bronze-framed glass curtain wall along the north and south facades will take full advantage of sweeping, perfectly centered views over Central Park to the north and the Manhattan skyline to the south, including many prominent New York City landmarks such as the Empire State building. The interiors feature Great Rooms with ceiling heights of 14 feet throughout, expansive floor-to-ceiling windows, formal entrance galleries with white macauba stone floors and dramatic views to the north and south, intricately patterned solid oak floors in a smoke gray finish, and wet bars in bitlis marble. Kitchens designed by Studio Sofield and handcrafted by Mark Wilkinson are available in either dark or light hand-rubbed plaster or chateau gray oak finishes. Residents will enjoy a host of well-curated amenities, including a private porte cochère entrance on 58th Street, a two-lane lap pool with private cabanas, spa with sauna, steam and treatment rooms, lounge with expansive outdoor terrace, private dining room, chef’s catering kitchen, triple-height fitness centre, meeting rooms and study. Services also include highly experienced concierge professionals attending to residents’ every need. Knight Frank Global Head of Research Liam Bailey said the development was an example of the ultra-prime sales that were becoming increasingly common in New York City. “The market for luxury property in New York is second only to Hong Kong, as we confirmed in our Ultra-Prime report earlier in 2019," he said. Tower Residences are available from $18 million (4,491 square feet) to more than $57 million (7,128 square feet), with sizes ranging from 3,873 to 7,128 square feet, and options ranging from 3 to 4 bedrooms. Prices and availability are subject to change. Tower Residences are being exclusively marketed by Douglas Elliman Knight Frank and are anticipated to begin closings in Q1 2020. Visit 111W57.com for more information or phone or email Victoria Garrett via the details below.